Available at Amazon and other retailers. Herein are compiled many pieces of the author's life ephemera. This includes family history, photos, legal documents, lectures, courses, letters, and various other materials. Many had been archived as original typed sheets or photocopies. These were scanned and the text captured by optical character recognition software. Some were damaged and best efforts were made to chronicle them here. A "compilation" is defined as "a work formed by the collection and assembling of preexisting materials or of data that are selected, coordinated, or arranged in such a way that the resulting work as a whole constitutes an original work of authorship." At 88, Milton is sorting through his paperwork. He's gathering the memories and ephemera of his life herein so that his descendants will understand where they come from. He traces his parents' lives, the four branches of his ancestors, and then he touches on health issues of the families. We learn of his early life and education up to his marriage and earning his BA, then about his Korean War experience. Back from the war, he begins his teaching career and continues his education as his family grows. 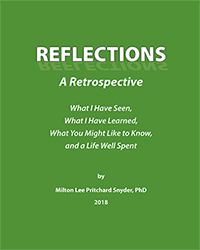 He gathers information into this volume so that we may understand his long and fulfilling career in the supervision of schools and school districts. He includes his lectures and courses while teaching at the university level. During his second career he was an executive consultant to many technical education companies. He keeps stressing the benefits of a good public education for all, remembering that Horace Mann (who initiated the public school plan) had emphasized that a republic could not long remain ignorant and free. Along the way we learn his political views and read some suggestions for keeping our democracy in these trying times. This book is full of family photos, letters, news clippings, remembrances and a fair dose of gratitude. There is plenty in this retrospective to keep future family members mesmerized!